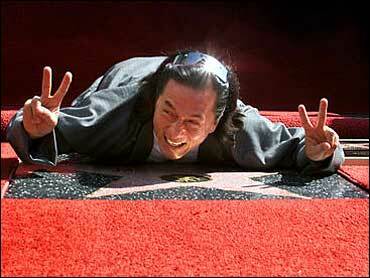 Actor Jackie Chan received a star on the Hollywood Walk of Fame, close to the entrance to the theater where the Academy Awards are presented. "I remember coming to Hollywood and seeing the stars and I wanted one," Chan said. "To show my appreciation I will make better films." Asia's biggest movie box office star for more than 20 years, Chan was asked what's next in his career and he said: "The Oscar." Chan's film "The Tuxedo" opened last weekend at No. 2 in North American theaters with receipts of $15.1 million. Chan, 48, has star No. 2,205 on the Walk of Fame, only about 25 feet from the entrance to the Kodak Theater. The theater became the new home for the Oscar presentations last spring. The star was a fitting tribute for the star from Hong Kong, whose martial-arts expertise is combined with physical comedy in his films, said Brett Ratner, who directed Chan in the films "Rush Hour" and "Rush Hour 2." "He idolized Charlie Chaplin, Harold Lloyd and Buster Keaton and it's perfect he's on Hollywood Boulevard sharing his star with these people," Ratner said. About 500 people gathered for the midday ceremony, including actor, producer and writer Owen Wilson, who appeared with Chan in "Shanghai Noon."